In November 2012, Newcycling’s Jesmond branch received a response from the city council to cycling plan for Jesmond we had carefully put together. We ask what progress has been made in the last nineteen months? A number of other requests, such as a space for cycling on Tankerville and – very bizarrely – to improve signing, were turned down immediately by council officials. So what improvements can we report since our Jesmond campaign started two and a half years ago, at the beginning of 2012? The sum total is… six cycle racks outside a supermarket, corner Acorn Road and St George’s Terrace. There has been huge publicity for cycling over the last few months. 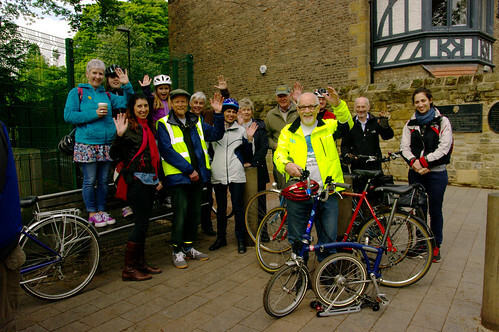 During the engagement period organised and from Sustrans (council’s design delivery agent), many good ideas have been gathered from Jesmond’s vibrant community. It has also become clear how much foot dragging there is from councillors and highway officers even when good projects are up for grabs. What’s more, there can be resident opposition to the suggestions of removing car parking and giving up road space to cycling and walking. Despite this, we believe, there is a majority welcome for making Jesmond more liveable and easier to navigate for cyclists and pedestrians, better and safer to get around. So, looking beyond, what might we see in place by the end of 2014? 1. a people-friendly Acorn Road (fingers crossed): one-way with traffic calming, cycle contraflow and a widened pavement on the North side – making it far more pleasant for all users. This will also affect the St Georges Terrace junction with Osborne Road. Great ideas – but not enough support from the council at present. We have good backing from South Jesmond councillors, lots of pressure and an active group of local members with a great citywide umbrellla campaign – so change will come – it has to! Really, Jesmond deserves much better, and it deserves a more neighbourhood-wide look too to assess and manage traffic and how people travel, now and in the future. This is something councils is reluctant to do as yet. Katja made that point of a holistic look at the Jesmond Library talk. Please contact our Jesmond rep Sally Watson ‎on newcycling.jesmond@gmail.com if you can help.